Christmas is always a special time for us and our families. We have always celebrated the season with a selection of hand-crafted gifts and decorations. This tradition has carried on into our beaded Projects. 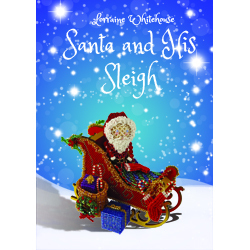 We hope you enjoy our latest creation - Santa and his Sleigh. We hope it becomes one of your treasured heirlooms. Note that this project is presented in our new 'Project Book' format and comprises over 100 pages of instructions, diagrams, photographs and charts. Some gluing and painting is required to complete this Project. For those of you who wish to have all of the parts required to complete the kit (all of the beads, findings and wood but not including glue, needles, paint, tools or nail varnish) then a single 'Kit Component Pack' option is available. For those of you who want to use their own beads we have also created a wood pack containing enough wooden items to complete one Project, 1 x Santa Mould, 1 x Person Mould and two sizes of Cubes. Note that the wooden moulds are an essential part of this project. As previously stated this project is covered by copyright. If you wish to use this project as the basis for one of your own classes we may grant you a temporary license for this use subject to conditions (details on application). In return, you will benefit from our full support and excellent instructions. Please contact us for further details. Just the project book is provided with this option. To add the Kit Component Pack, the Wood Pack or any of the individual beads or components then these will need to be added separately. Alternatively, why not try our Kit Component Pack. If you want to complete the Project again but only need the wooden component parts, then choose this option. It contains all of the components needed to complete one Santa and his Sleigh, i.e. 1 x Sleigh, 1 x Person Mould, 1 x Medium Cube and 1 x Small Cube. Again, with this option there are no instructions. The option to choose if you have your own beads. Note, no need to order if you are having the Kit Component Pack. Listed below are some related items that you may be interested in.